Handwriting. I remember handwriting instruction in my grade school years clearly. Perhaps it is because I'm a lefty, which tended to make me stand out during instruction and also cause my teachers a small amount of stress. Regardless, it was certainly a focus of those early years, requiring instruction and practice. However, is handwriting instruction necessary today in the age of computers? I've heard experts say no, that the progress of technology has replaced the need to go beyond basic writing instruction. However, we now have a generation who can no longer write legibly nor even read cursive, let alone write it. High school students panic with the requirement to complete the essay portion of the ACT and SAT exams in cursive. I'm not sure that is progress. But with a son who has trouble putting pencil to paper, I certainly am not in favor of pushing handwriting with young kids when we have technology to assist. Therefore, my approach to handwriting instruction in our homeschool has been a bit mixed. My 9-year-old son is functional. Legibility has a lot to be desired. We have also (unsuccessfully) studied cursive. However, handwriting hasn't really been an emphasis in our homeschool and I tend to put it aside for less painful endeavors. When Peterson Directed Handwriting arrived for review, I was open to giving it a try. I received the Grade Three Homeschool Kit Complete, Making the Transition to Cursive. Included in my package was a teacher handbook, a non-consumable student book, an audio CD, a CD-Rom with letter animations, two position guides and two Try-Rex pencils. The first thing that I noticed was that this company has been around since 1908. Impressive. Secondly, the Peterson method is heavily research-based and focuses on the movement and rhythm of writing. Obviously not a new method given the 100+ year established date, but certainly new for this modern homeschooling mom. This is not a copy and trace program. Learning how to write is taught by breaking down letters into strokes with the same muscle pattern, sliding right and returning to a baseline. Proper paper placement, body position and pencil grip are an essential component. While each lesson requires direct instruction and supervision from the teacher, it is not a difficult method to teach. Each motion is first taught on a large scale. The student watches an animation using the CD-Rom or may simply observe the teacher write the stroke on a white board. Before even picking up a pencil, the student performs the motion by air writing, working on large muscle control and memory. Action words or counting are chanted to the rhythm of the movement. Once large muscle control is mastered, students then finger trace the pattern using the student book while verbalizing the rhythm. The last step is to write and say the pattern. After writing practice, the student may reduce the size of the strokes. Basic strokes are eventually connected to form letters and then words. See the animations below to get an idea of the letter formations. The “how” is rather easy. If you are interested in more of the “why”, I highly recommend you peruse the information-filled website, including a video presentation explaining the method by Rand Nelson, also known as Mr. Pencil. Our first day of instruction ended up with him in near tears. However, this is not a program that you can access effectiveness in the first week. After working with the program for a couple of months, I'm still not sure of its effectiveness. The compliance has gone up as has the pencil control, but my son has not progressed enough to be writing full words in the beautiful cursive style on the workbook pages. I’ve observed improvement and for that reason plan to continue for the rest of the school year. For kids with handwriting issues, this is not a get-results-quick program. It will require dedication of both parent and child. Quite a bit of preparation time is required before even starting the program. The teacher will need to browse the site and read over the manual before beginning. I found the teacher manual to not be exactly user-friendly at first. This isn't a program were you can just jump in nor one you can give your student to do alone. Once lessons start, the time commitment is about 10 minutes at the most, less if that is the limit of your child. If your child is not compliant, it can be a long ten minutes. Think of it as physical therapy. You must go through a bit of pain, but with consistency things will get easier resulting in functionality in the weak area. This program won’t have your struggling writer begging to do handwriting practice, but it may very well have fantastic results if you put in the time. Prices vary depending on the package. The Complete Grade 3 Package I received costs $38.55. The Basic Package, containing just the teacher and student books, placement guides and pencils costs $15.05. 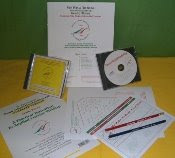 The CD-Rom and music CD, included in the Complete Grade 3 Package, are used for multiple grades and are individually priced at $17.95 and $9.95 respectively. The letter animation CD-Rom was helpful, but not completely necessary. We didn't really use the music CD since my son felt too old for it, but it may be a helpful tool for younger kids. If handwriting is important to you and you are willing to put in the time, Peterson Directed Handwriting may be a program to consider. It would be best for those just starting out or those needing intervention in their handwriting. While I don't have dramatic results to report, I see this method being effective with kids that struggle with handwriting. Furthermore, the customer service seems to be great, with a genuine concern for helping teachers. parents and students with proper handwriting instruction. You may request a consultation conference to discuss your handwriting program needs with a Peterson handwriting specialist at the Peterson website. My thoughts on handwriting instruction have changed since using Peterson. At the very least, an effort is being made to correct a hand-tiring pencil grip. At the very most, I hope the results will be some beautiful cursive writing, but I’ll settle for legible. I expect the progress will be slow, but bad habits take time to form and even more time to undo. Visit the Peterson website to find more about the program and read the volumes of information on handwriting instruction. To hear what others had to about Peterson and to hear about other levels, visit the TOS Homeschool Crew blog. My dyslexic son has finally started making progress in spelling with the help of All About Spelling (read review here) and other resources. However, as his spelling improves, a new problem has surfaced. He'll correctly spell a word, but not the correct one contextually. For example, he may write, "I went over to there house," or "I want to go to." For a child that is finally learning how to spell words correctly, it's a bit frustrating to hear, "Well, that word is spelled correctly, but...not in the manner that you used it." While I am ecstatic that my son is spelling well enough to have this problem, it has become apparent that I need to start teaching homophones. Homophones are words that sound the same, but are neither always spelled nor mean the same. All About Homophones: Your Complete Toolkit, authored by All About Spelling's Marie Rippel, is an excellent resource for teaching your children about the confusing world of homophones. Most children, and many adults, have trouble with homophones. This is one area in writing where spellcheck will not help you! All About Homophones tackles 101 pairs or sets of homophones throughout its 241 pages with graphic organizers, worksheets, puzzles, games, and more. This is a multi-level resource, covering grades 1-8. An introduction and clear instructions are provided for all of the activities. There are six different graphic organizers from which to choose. Graphic organizers are visual tools for learning. Students can get creative by drawing pictures, including definitions and writing sentences in a way that helps cement the different meanings of the homophones. 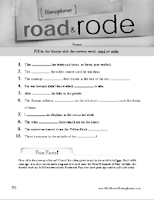 Each of the 101 worksheets covers a homophone set with ten fill-in-the-blank sentences. 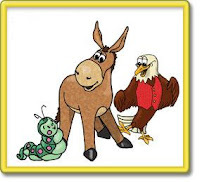 Also included on the bottom of each worksheet are interesting facts, fun activities, tongue twisters and more relating to the homophones being taught. Marie Ripple gives many ideas and suggestions for implementing the worksheets through vocabulary, creative writing, speaking, art/drama and other exercises, staying true to the multi-sensory method of her spelling program. There are fourteen crossword puzzles that correlate to the words taught on the worksheets, giving students several different ways to practice using the homophones they are learning. 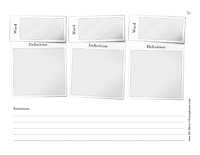 All About Homophones is rounded out with instructions and printouts for six card games, a list of book resources, a student record sheet, tongue twisters, a list of the riddles and puns from the worksheets, answer keys and a 6-page mega list of homophones found in the English language. You can see a 32-page sampling covering each section of the book by clicking here. All About Homophones has proven to be an excellent resource to help my son learn these frustrating sets of words that sound the same, but have different spellings and meanings. A couple of times a week I would integrate a worksheet right into our spelling lesson, either before or after. Since the worksheets and activities were short, he didn't mind the extra task and it was easily completed while I was setting up our spelling materials for the day or cleaning up. We haven't had the opportunity to try any of the games yet, but I'm sure they will be a welcomed addition. Furthermore, this tool isn't just for beginning or struggling spellers. My 12-year-old daughter is a strong speller and writer, but there were many homophone sets included which she would benefit from the practice. While I have seen short workbooks and picture books addressing homophones and other activities on the internet, this is the most comprehensive resource on homophones I've seen. All the work is done for you, there is no prep time, and it's written in a direct and easy-to-use style. If you are teaching several students at different levels, this is one of those rare resources that can be used by all. It is also a great choice if you have a beginning speller, giving you the tools to teach homophones right along with your spelling and language arts instruction for many years. **For a limited time, get $10 off! To read more reviews on All About Homophones, visit the TOS Homeschool Crew blog. Even when my kids were tiny, I knew that I wanted them to study piano. Not only did I want them to have the joy of playing a musical instrument, the study of music has been linked to academic success in other areas. As soon as my daughter turned 4, I started to inquire at local studios about lessons. My musical ability is very limited and I did not feel I could give instruction at home. Much to my surprise, starting formal music lessons before age 7 was discouraged. Ability to read is often a prerequisite, but even though my daughter could read at 4, there was still some hesitancy. However, I believe that children can enjoy learning music even before they are ready for formal academics. We did eventually wait until my daughter was about 5 1/2, with my son starting about the same age. However, I wish a resource to teach preschoolers music at home had been available to us in those early years of learning the basics. Kinderbach is an online music instructional program for ages 2-7. Karri Gregor, Kinderbach founder, teaches children the basic principles of note reading, rhythm, singing, identifying patterns and playing the piano through over 300 web-based video lessons. The 60 lessons included are considered to be 2 years of instruction. You can view a syllabus of the curriculum by level here. The weekly lessons are further broken down in four sessions, each approximately 3-5 minutes long. Printable PDF coloring pages and worksheets accompany the video instruction (see below). All that is needed is a piano or keyboard. Even an inexpensive toy keyboard will be sufficient. The video presentation is a combination of real people (and animals!) and simple cartoon drawings. With Karri directing information and questions toward the child from a cartoon room, the look reminded me somewhat of the popular PBS show, Blue's Clues. However, keeping distractions at a minimum, the characters are not animated. Characters are used as visual aids, either as drawings or puppets with Karri, in the story line. 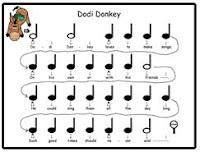 Frisco and friends, starting with Dodi the donkey, who lives at the two black keys, explain musical concepts and note reading in a way that a young child can understand and apply to future music training. For example, the first letter of each character's name corresponds to a letter key and each character has a place on the keyboard. Children who can neither read nor have letter recognition can experience beneficial music instruction. Lessons can be repeated at any time during the subscription period. There are several levels of programs and payment options. I reviewed the Bronze online membership. Other online membership options are in development and can be viewed here. The DVD option is the best choice if you have a slow internet connection or if you have younger children who could benefit from the program at a later date. It is at a much higher cost, but you could also resell the program to another homeschooler when completed, reducing your expense. There are several other DVD packages, which can be viewed here. Compared to private instruction, Kinderbach is a steal with a one-time payment of $85 for a yearly subscription. In private lessons, the rate for young students learning the basics is the same for the experienced student studying complicated classical pieces. Learning the basics at home will save you the expense of those first private lessons. For comparison, we currently pay $24 for a 30-minute lesson. The 1-year Bronze online membership is equivalent in cost to less than four weekly private lessons in our area. For 60 lessons, our annual cost for one child would be $1440! If you have more than one child in the targeted age, Kinderbach can be used by both for even more savings. Furthermore, lesson are done in the privacy of your own home, at your child's pace, and with no parental experience in music required. At ages 9 and 11, my children have been studying piano for 4 and 6 years respectively. They are a bit too old and experienced to test run this product for review. However, I believe they would have both enjoyed this program at the preschool age as an introduction to formal lessons. I did feel that the lessons were too short for a child on the older end of the targeted range and that the content and presentation was geared more towards preschool or early K. Do not expect your child to be playing Bach at the end of this program; Kinderbach is an introduction to music study. Some sessions were devoted to listening to songs and the progress was slow going. However, all 4 sessions could easily be watched in one sitting, for a weekly 20 minute lesson. Most private lessons are about 30 minutes, with probably a good 10 minutes devoted to items other than direct instruction. 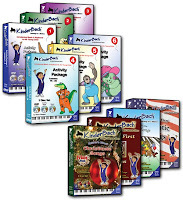 Kinderbach will appeal to most young children and engage them with its fun presentation. If you are considering formal lessons for your young child, this would be an excellent resource to give them an early start. If you aren't sure your child will have enough interest in studying music, Kinderbach would be a good way to try out readiness and interest without seeking out a private teacher and making a purchase of an expensive piano. The Bronze online membership is the most economical way to try the program and will give your child(ren) a full year to explore music. Try out the first two lessons for free here and see if Kinderbach is the resource for your family to introduce your young child to the joy of music. All products carry a 30-day no hassle return policy. Visit the Official Blog of the TOS Crew to read more reviews on Kinderbach. Times are tough and cutting your grocery bill is a great way to make your dollars stretch. Not only that, cooking from scratch will provide your family much healthier meals than buying convenience foods. Head over to the Quiverfull Family blog for a chance to win a print copy of Dining on a Dime Cookbook by Living on a Dime. Check out other titles at the Crazy New Years Sale going on at Living on a Dime, devoted to help you live within your budget. Pick up titles at 50% off. Now that's pleasing to the budget! I've been trying to go completely chemical-free for household cleaning products, not only to help our budget but our health as well. Vinegar and water make a great all-purpose cleaning spray. For dusting, I use a micro-fiber towel misted with water. Baking soda is effective as a mild abrasive and a large bag can be purchased inexpensively. My latest find for chemical-free cleaning is a small brush that came with a dustpan at the dollar store, meant to sweep up small floor spills. I've discovered the bristles are soft enough to not scratch but stiff enough to knock off dust from almost anything. It's been used to brush dust off baseboards, lampshades, curtains, window sills and light fixtures with much better success than any spray-and-wipe product. The size is perfect for the hand and the narrow shape makes it easy to get into crevices. It's complete reusable and best of all, it only cost $1.